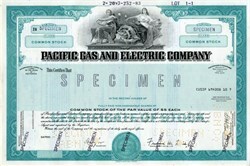 Beautifully engraved SPECIMEN certificate from the Pacific Gas and Electric Company. This historic document was printed by the American Banknote Company and has an ornate border around it with a vignette of two allegorical women sitting next to a power generator. This item has the printed signatures of the Company's President and Secretary. Pacific Gas and Electric Company, incorporated in California in 1905, is one of the largest combination natural gas and electric utilities in the United States. Based in San Francisco, the company is a wholly owned subsidiary of PG&E Corporation. There are 19,575 employees who carry out Pacific Gas and Electric Company's primary business�the transmission and delivery of energy. The company provides natural gas and electric service to approximately 13 million people throughout a 70,000-square-mile service area in northern and central California.